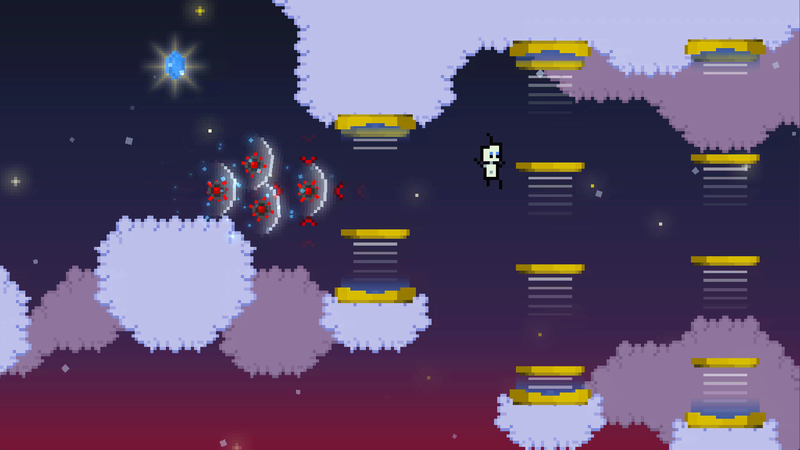 Nubs’ Adventure is an exploratory platformer (some people call it a Metroidvanian). You take the role of a little guy called Nubs and join him on his quest to find a new home for himself after it has been destroyed. 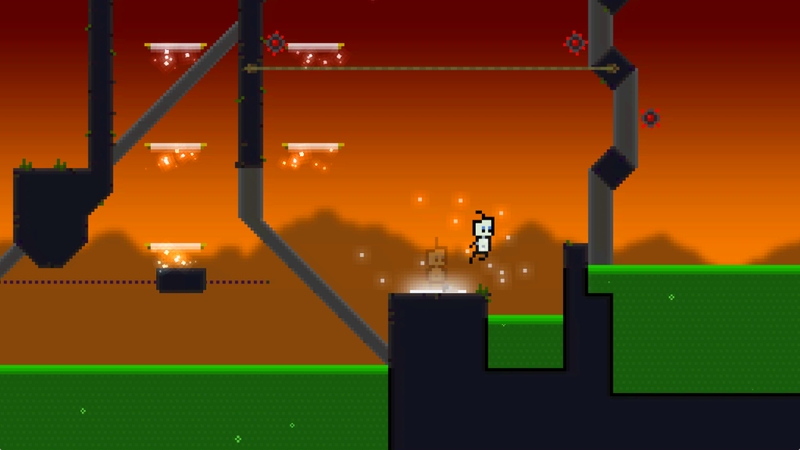 Nubs’ Adventure is platforming action and exploration combined with an intriguing story and a huge world to explore. Fun game. I wish I could code like that. Also there is a glitch on the first switch with the crate. If you hit it with the boomrang while inside the gate you can knock the crate off the pressure plate. It causes you to get stuck with no way to get out. Heh, yeah that’s true! :) In the other areas where you could get stuck there’s always something to commit suicide, but not in this one. Thanks for the hint! Hi I found a glitch . there is an area below the area with the first transporter, u go in through a water pipe and later find a red crystal surrounded by lava pit and there is an exit water pipe just beside it. I jumped to get the crystal ,got the crystal but missed landing on the small land just below the crystal. 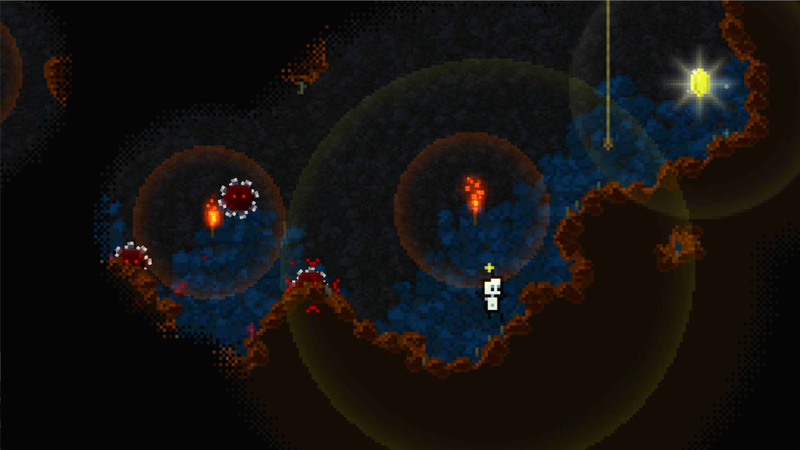 Now I respawn below that small land and keep falling in the dark. If I somehow die I will respawn at the same place. Hi I found a glitch in the game. there is an area below the area with the first transporter, u go in through a water pipe and later find a red crystal surrounded by lava pit and there is an exit water pipe just beside it. I jumped to get the crystal ,got the crystal but missed landing on the small land just below the crystal. Now I respawn below that small land and keep falling in the dark. If I somehow die I will respawn at the same place. Yeah its a briliant game sadly i cant recover from this bug, i will have to start again. Otherwise good job. I enjoyed Rico a lot, but this is even more marvellous. Is it possible to get all the stars in the demo of the Android version? One remark: basicly I could go back to the all the previous places to investigate except from room four to room three. I couldn’t jump off the cliff to the other platform on the left side without dying. Yes, you should be able to get all the stars, I think. I’ll check again when I’m home and tell you for sure. Hello Max! First of all want to say “Thank you!” for such an awesome game! And congrats with release! But I’m playing on ipad 4, and looks like have some bug, that makes me not possible to play further. When I talking to PAI it freezes on “This token opens up the world for you.” It’s just not response for any tap. :( It is freezing with both PAI wich I can get for now. I’d like to pay, but button in the main menu also not working. It’s just crashing. Please be patient for a few more hours, I think the reason is that the IAP is not distributed across the world yet. Great, fun game! But I am also having the issue of having purchased the full version and it just crashes now. I’ve tried restarting, reinstalling and restoring, but nothing. Is there a solution to this yet, because Nub really needs his home fixed! Thank you. Sorry for this! :( I’m working on a fix. I’ll report back to you once it is available. Hey! If you want, you can try the latest beta build, that may fix your error. I invited you by email. I purchased the game, can’t open it anymore, was a part of the Test Flight, that was bunk because when I died I lost everything and couldn’t backtrack, so I think you should reimburse me for my purchase until you get your game in effect. I will happily purchase your game when it works, but until then, I’ll have my money back please. Is this game coming for pc ? Fantastic game. I am stuck though. Can one collect all the 30 stars or diamond that the fairy asks on the free version? Just asking. Would have loved to pay had I been earning. But for now it’s just the free game for me. Hey there, I wanted to tell you how much I was loving the game. Wonderful stuff in general! However, I’ve recently got to the boss fight where you take control of the worm and, well, it’s pretty a miserable experience. When you drop from the ceiling each time you attack you can’t see what’s below you so it’s a total crapshot whether you hit a mine or not. When you add in the huge number of hits the boss takes *and* the fact that you can easily be bounced from one mine to multiple others with no control it becomes very frustrating very quickly. I don’t want to give up on a game I’ve enjoyed so massively up to this point but I don’t think I’ve got the patience to plug away at something so random. Indeed it’s such a jarringly bad set piece in an otherwise wonderfully designed game that I’m wondering whether I’m missing something and I’m suppose to be using a different method? Or, if not, any tips you could give me for this section? Thanks for your response, it’s appreciated! I’m not sure if I’m going to get through this part though on current form. I spent my entire commute this morning on it and it never got further than about half way before dying. In each run at least once I’d blindly drop from the ceiling only to hit one mine and then get bounced uncontrollably into two or three more which knocks yours health down so far as to pretty much guarantee failure. My plan is to wait for a few more days to get additional feedback from player and then issue an update with all the corrections. You think you can hold on for a week or so until the boss fight is improved? Out of curiosity: are you on Android or iOS? Heh, well, I couldn’t resist giving it another few goes over lunch time and managed to squeak through on one of my attempts so I’m on to the next part! Obviously it’s probably still worth doing something about it for other players (my suggestion for a ‘quick win’ would just be to drop the number of hits the boss required to kill as that would instantly make it a lot more achievable) but I’m all good now. Oh, and I’m on Android in case that information is still of use to you. Aaaaand done! Brilliant stuff, thanks and well done for such an excellent game all round. Side note: I finished the game with 100% which means five gems left over; am I missing a secret here? So, I was enjoying the game, but right after I bought it. The game keeps crashing, and now I can’t play at all. I have an Iphone 6 with IOS 8.3, I have also restarted the game several times as well as my device. I’m sorry you’re having trouble! :( Have you tried the “Restore Purchases” button in the options menu? Its reachable from the main menu. So, I reinstalled the game, and now it crashes as soon as I open it. I will try to fix this with the help of the crash reports I should receive soon. In the meantime, you can either wait for an update or request a refund. Here’s a guide for this in case you haven’t done this before: http://www.macworld.com/article/2140066/how-to-get-an-app-store-refund-for-kids-accidental-in-app-purchases.html That will get you your money back at the very least. First off wanted to say I love the game it’s very addicting an challenging at points haven’t been able to put it down. I have a question however about the area I’m currently stuck in. Its actually exactly where the second screenshot of this page shows. (With the toxic liquid and orange skies.) I can’t seem to get to where I need to be although I can see it. Nubs can’t jump high enough for me to get to the only place I see I can advance from (the platform with the diamond). I’ve been trying to do this for a while and was wondering what I need to do differently since I can’t seem to figure it out. I think I know what you mean: you can’t get to the platform with the diamond from the left. That’s just too high and Nubs will die because of the mine. You have to go down the vanishing platforms first, get onto the moving platform below, then jump to the right to the platform with the checkpoint/savepoint. From there, you can make your way up again along the taut ropes. Love Nub’s Adventure. I’m doing a Let’s Play of it on iPad for my YouTube channel, if that’s ok. Also, I’m glad to see it’s coming to Steam GreenLight soon. I’m really excited to have it for PC. Also, I want to do a Let’s Play series of Rico too. Is that ok? Do you perhaps know when it will be up on Steam Greenlight and/or the Steam release? I’m working on getting the Greenlight page up! Should be up soon! :) After that, it depends on how well it is received by the community. Any way I can send you a screen shot. I think I found a glitch, and by found I mean I ran the game. I’m running it on an iPhone 5c iOS 8.0.2 and when it starts up and gets to the title screen about a third of the screen on the right side is just a black box then on the left its a gray box but with the bottom quarter of the box showing the top of the title screen where I can make out a star filled background and the word “NUBS”. I’ve tried restarting my phone. I’ve tried reinstalling. I even backed up my phone, reset it and tried again. I’m kind of a trouble shooting guy, I like this stuff I like solving things, so I then proceeded to jailbreak my phone to see if I couldn’t some how install something to force a screen resolution or maybe even dump an error or debug report but alas nothing so I thought I would just let you know and maybe you could figure it out or already know about it and are working it out. Can I ask you for help? I have created a new version that I think fixes the bug. Would you help me by testing it? That would be AMAZING! :) You’d get an email which lets you install the new version on your device and see if it works. unistalled AppStore version of Nubs Adventure and installed the TestFlight version 1.2(1). Started it up, same issue. Rebooted, issue is still present. Anything you want me to try specifically? Bummer! Can you send me a screenshot of how it looks like? Yes, you will need to pay this single fee if you want to play the full game. Hi, only a question, when will be this game at computer i am interested, please make it soon. I love this game, but I’m having trouble getting the key in the area just below the region “Far Away”. This area has some water pits and some acid pits. I believe I need to jump on the block that is moving up and down, then while the block is going up, I need to jump up to the little cut away ledge on the left. I’m assuming that I’m just not that good at executing the 2nd jump? Took a LOT of tries, but I got it eventually last night. Ok in that same area in the room above where the transporter is at there is a door with a cable only I can’t open it and I can’t jump up to get on that ledge. Also that jump for the key is tough I can’t get it but I’ll keep trying it. As for that door with the cable shouldn’t it open up? I have the same issue. I can’t open that door, and I can’t climb on the ledge higher. I’ve watched walkthrough videos, and there was no issues with that door. I’m not fully sure what you mean… can you post a screenshot or show a video where you’re having trouble? Man! Congrats for the fantastic game! I’m enjoying it very much but I’m stuck right in this place, to get the key that is near the acid and water pits. I’m trying for almost 4 hours and I’ cant reach that dammed key! (lol!) What is exactly the secret to archieve that jump? I’m in about 81% of the game. Tks! My 4 year old son and I are playing your game and we love it! We are 73% done and seem to have all of the rooms open except for the one underneath grass valley. We either need a blue key or a yellow key (map seems to indicate blue but when you get to the locked gate it looks like the key should be yellow as the gate is black & yellow.) in any case, we have no idea where to find this key. Could you give us a hint? Thanks! I’m stuck at 75% and cannot find another way to move on in the game.. There is a new area in grass valley 3 but I cannot find it. Is there any way you could help me out? I think you mean you haven’t yet reached the sector to the right of “Grass Valley III”, right? Well, you can’t get there from this side. Have you yet taken the elevator into the sky in the sector right of “Grass Valley III” (the sector above the one you’re talking about)? hey i think this is an amazing game i just recently got a new phone and now i must restart is there anyway that i could restore the purchase for the full game without having to buy it again? Wonderfully addictive game. I finally finished it this evening with 96% completion. The only area where I do not yet have a gold star is the green area to the bottom left if Grass Valley III, where the boy tells you jumping would be suicide. Are their diamonds there I haven’t found? I feel like I’ve searched the entire level. I’m not sure what the boy’s warning is about, either. Perfect! This was a fantastic game. I really enjoyed playing it. I can’t wait to play through it again. Hi there, I decided to post on here because I just found your website and I must say I LOVE YOUR GAMES!!!!!!! I am on iOS and would love to have these games on Steam as well. I have an android device I use occasionally but I feel that iOS runs smoother. I loved Rico and now am playing Nubs Adventure. This little guy reminds me of Gir from Invader Zim, lol. 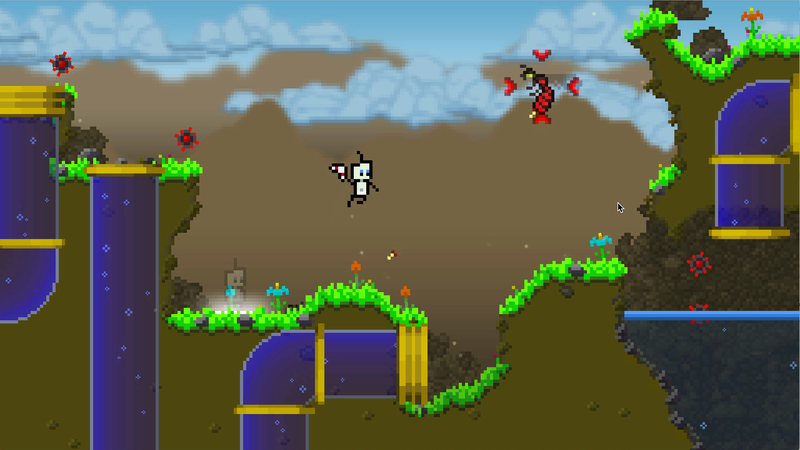 Right now I am stuck on the part with the worm boss fight 28% of the game and our little enemy in his flying machine. It is a rough fight but I have to keep trying…its been several commute rides that I’ve tried to beat it. Each time I get the engines to flash white but nothing ever happens beyond that, I just die eventually. I guess I need to keep hitting them? Anyway, no complaints, I am actually mad with some of the poor app store and online reviews. I LOVE the music, I LOVE the art, I LOVE the story and sense of adventure. Absolutely a piece of art. I am trying to get everyone that I know to try the game out and buy it. I NEVER buy games on the app store let alone for 4.99 but your work deserves it, so I support it. Thank you, please continue to make more. I would love to help identify bugs/test, try the games out! Thanks for playing Nubs’ Adventure! How close are you to being Greenlit? Hey I saw you were Greenlit. Congratulations!! When will see Nubs’ go live? Also, will there be a way for our game save from iOS will be able to be continued on the computer? Sorry for this! :( Have you tried re-installing the game? I’ve had people report it fixes the problem for them. I’ll try that — but I guess I will have to start over from the beginning? sorry you’re experiencing this. I looked into the issue and it seems like the game development library I’m using is not yet fit to support iOS 9 (Beta). But the people in charge said it would be by the time iOS 9 is officially released. So my hands are currently tied in this matter, but I’m sure that Nubs’ Adventure will run on iOS 9 soon! Thanks for continuing to try! :) I hope the issues are resolved soon. Do you want to beta-test it? :) I can’t fully test it yet because I don’t have an iOS 9 device, but would you like to? I’d just need your email address that you log in to the App Store with. Hey, I just bought Nub’s Adventure the other day and I love it. I found this bug where if you’re being followed by seeking mines and you enter a teleporter the mines will explode and you won’t be harmed but when you exit the teleporter you then can’t interact with anything else until you die. I just thought I should report it. I finally beat the game! It’s a pleasant experince. Thank you and keep bringing this kind of games for us! Hey I’ve just downloaded the game and i’m loving it already. I just wanted to ask what were the steps in making the game and what software and programming languages you used. I am currently in the midst of coming up with an idea for a game based operating system for a computer and i would like to make it in the same fashion as your game. I saw you were Greenlit. When is the game going to be released? Yeah! :) Would you like to beta-test? You’d basically get the full version for free! If so, I can get you a key ASAP. I would absolutely love to beta-test! why do you do this to me nubs? Wait! You’re complaining that I charge something for a game? I spent two years working on it and find that it’s worth a few bucks. I’m pretty sure the vast majority of people playing your game are happy to throw a few bucks in your direction. I know I was. It’s a great game, loads of fun, and the money I paid you is a simple way of saying ‘thanks, I appreciate your time, effort and talent’. Some people just don’t wanna pay for anything! I love the game. It is worth of every it’s cent and even more (I’d like to buy the sequel, should you write it. The atmosphere and the music deserve the best words. I missed such a game feeling since I played Commander Keen in 1994. Sorry you feel that way! But I can assure you that the boss is beatable… it’s hard but doable! Maybe try “a different approach”? I don’t have any data that it shouldn’t work, people have successfully bought it in the last few days and I didn’t change anything. In which country are you? Great game! Any plans to update it to make it more iPad Pro friendly? The buttons are WAY TOO small. Maybe either detect device type and give us larger buttons or create a function to resize the buttons ourselves? Well I’m a dummy. I thought you had to touch on the button graphic but I see now you can touch way above it as well. I was thinking width wasn’t the only issue and thought that to be a bit odd, but it wasn’t. Thanks! i had enjoy very much but i not know how in 57% i kill boss of i got to gate that tranport every where but after that the door is not opening why??? Hi! Which boss do you mean? Can you replay the full game after you finish it? Why the hell is not this mentioned before the player begins the adventure? Before starting the game, nowhere it is notified that the game can not be completed without pay, which is very unfortunate and inappropriate. Only when the player has advanced an important part of the adventure is when the game hints that it can not be completed without payment of a fee (a total disrespect to the user). It says so in the app description (first bullet point). It was not my intention to fool players into it. What should I have done? A big warning that tells the player right from the start that they need money? I don’t want to scare new players right away. I could have also made the game a simple paid app, in which case players would have gotten nothing without paying. All I request is that the rules are clear from the beginning. In the Google Play the “first bullet point” you say does not appear. I think it’s only in the App Store. Otherwise, I appreciate your taking the time to answer my comment =). It’s shown, but you have to click on the button to expand the text (the game’s description is the same in App Store and Play Store). If I had the chance to mark the game as “free with In App Purchases” within the Play Store, I would have done so immediately. But Google only differentiates between “free” and “paid”, even though “free” often includes IAPs. Apple at least shows the top IAPs and in Nubs’ Adventure’s case, it’s the only one called “Unlock full game”, which makes it more obvious. Love the game but am stuck … Is there any trick or tips to getting past they guy flying around when you are the work thing? Have been trying for two days and get one side cleared but always die before I can finish him off … Please help!! But can’t use my mfi controller, thoug in app store description told so. But this doesn’t work with mfi controller though in app store description said that! Sorry it is not working. iOS is regularly changing stuff, so it’s hard to keep up. What kind of controller do you have? Maybe that’s an interesting read for you! Are there any plans to enable support for AndroidTV devices? I would love to play it on my Nexus Player. Plz help me. I’m at 93% with only 2 levels without diamonds. I know 2 people have asked this but I still can’t find the diamonds. On Grass valley 3 the one with the beamer and the 1 to the left of it. I mean I got the one u move the box on top of but it’s still not showing a yellow star. I went to the one to the left as u had told someone else (I don’t have the diamond for either) and I went in the pipe to the right @ bottom finished that lil level with diamond, came out the pipe back on Grass valley 3 and still do not see another diamond anywhere. Plz help. Thanks in advance. BTW love love the game!! Thanks for making such a great game. Great music and simplicity are its key features. I am ready to pay 10 times as much price as for NUBS 2. But make this game for fun not for money in case you do. I have a bug, before fight with Wiley in prevoius zone there is two bridges that you need to activate. But actually you can jump over pit without activation of second bridge. And if you do that and then loose the fight against Wiley, he disapeares and never come back even if you reload zone. That means that you cant beat Wiley anymore and continue the game. Thank you. I purchased the full game on iTunes but the game is still locked. Pls advise. Hey! Sorry for this :( I assume you tried the “Restore purchases” button in the options menu?